A prison film for CNY? Yes, here is a film about ex-prisoners which can actually make you laugh and gets you in the festive mood, no less. 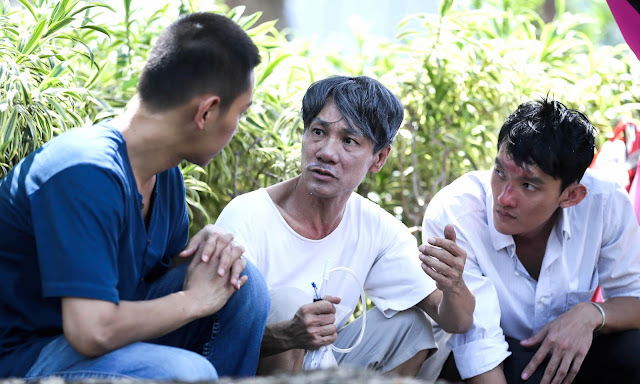 Take 2《遇见贵人》is a comedy about four prisoners who resolve to turn over a new leaf after they finish serving their jail sentences. 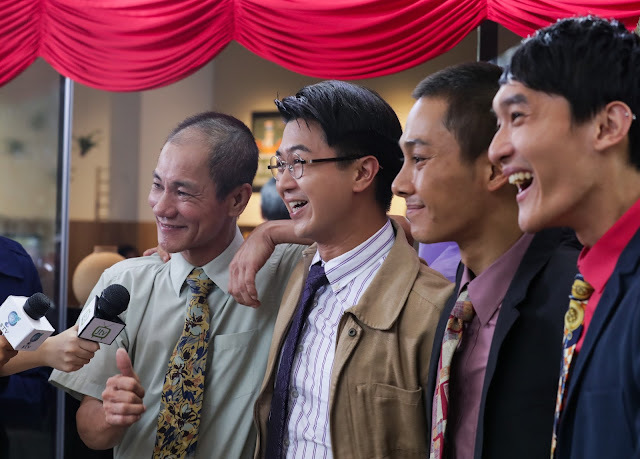 They are played by Ah Boys To Men star Maxi Lim, veteran getai host Wang Lei, wacky comedian Gadrick Chin and Long Long Time Ago's Ryan Lian. The rest of the cast includes such familiar faces as Mark Lee, Henry Thia, Chen Tian Wen and Dennis Chew. This film is director Ivan Ho's debut feature as a director. He has previously been a screenwriter for some of Jack Neo's films, including Ah Boys to Men 3: Frogmen and Long Long Time Ago. 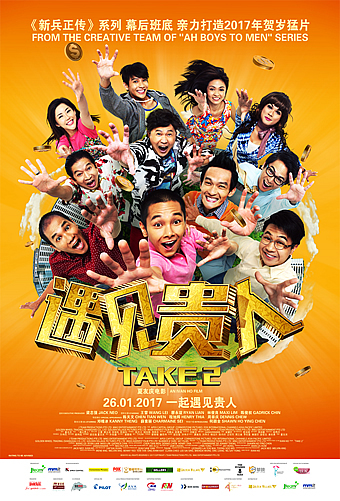 Take 2 was your first time in the director's seat, after co-writing several of Jack Neo's films. How did that come about? Were you eager to take on the director's role? Perhaps it was because, while director Jack Neo was filming [one of their previous collaborations], I would often spontaneously suggest some of my whimsical ideas. Maybe it was for this reason that Jack felt that I was suitable to direct comedy, and offered me this valuable opportunity. What did you learn as a director that you might not have encountered while you were a screenwriter? As a screenwriter, I only need to focus on the plot structure, characterisations and story development, whereas the director not only needs to keep all of these in mind, he also has to account for the shooting schedules and the entire movie's rhythm and tone. It's very tough, even harder than writing a script from scratch. Were any scenes particularly difficult to shoot? The action scenes near the end of Take 2 were most difficult, because we had to simultaneously handle the choreography, special effects and acting, and on top of that, there were many people involved. Personally, that was the hardest scene for me to shoot. How did the idea for this story come about? Did Jack's previous ex-convict film, One More Chance (2005), have any influence on the story? The entire idea for the movie came from Jack. He has always felt that ex-convicts are a rarely acknowledged group of people who deserve to be given compassion and opportunities to return into society. That's why he hopes that the movie can bring out a positive message of redemption, and hence induce more in society to pay closer attention to this group of people. Hence the previous movie One More Chance also centred on the ex-convict theme, but the style of Take 2 is very different. The earlier movie focused more on prison life, whereas Take 2 mainly skips over events within the prison. On that note, did you consciously try to make your visual/directorial style similar to or different from Jack's? Although I take Jack as a directorial mentor, my childhood pop culture references differ completely from his. Personally I am a huge manga fan, which is why my humour style varies so much from Jack's. However, to pay tribute to him, I would ensure that some scenes retain that 'Jack Neo' style, in the hopes that this will give audiences a knowing smile. In this world, there are so many different humour styles, but in the end their motivation is the same: to make people laugh! That's my own raison d'être! Which actor did you most enjoy working with? In Take 2, the actor I admired most was Wang Lei. As one of Singapore's most popular getai figures, his getai schedule was packed, but he would have to find time in between shooting to rush to host getai events, sacrificing his rest time. Yet Wang Lei would do this without complaint, and remained very down-to-earth, putting his trust and encouragement in me even though I was a rookie director. Take 2's ending action sequence even features Wang Lei's first time attempting action choreography -- the results will surprise audiences! How did the actors get along? The entire cast was like a family, bonded tightly together. Whether during filming or outside of it, they were great friends and compatriots. I've never seen an entire crew get along so harmoniously and cheerfully. It was a pleasure! Which scene should we most look forward to? As I've mentioned previously, Take 2 ends with an epic and hilarious action scene, which is the first and most intense in Singapore's cinematic history. Topped with several cast members' crazy antics, it has to be the movie's most eye-grabbing scene. Take 2 will be released on 26 January 2017 in cinemas islandwide, right on time for Chinese New Year! Follow the happenings and news about Take 2 on the Facebook pages of mm2 Entertainment and JTeam. For the full list of January 2017's 10 films under STOP10, click here.